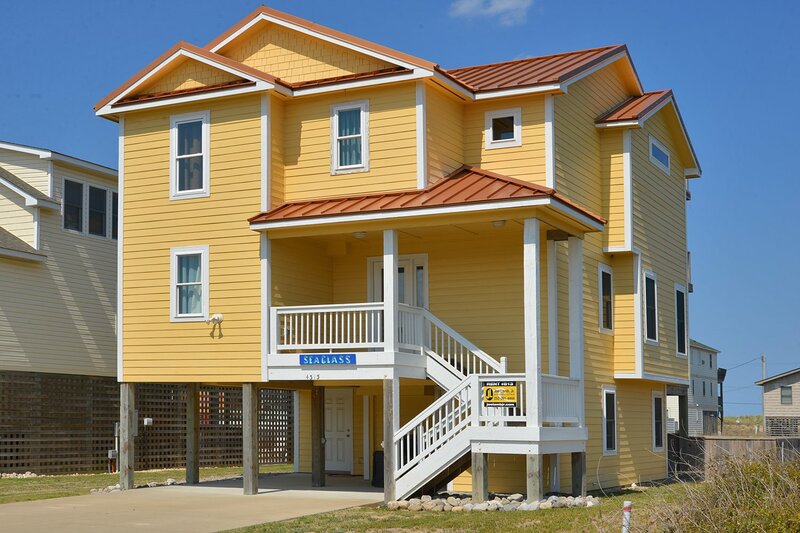 This is an exceptional home that provides Ocean Views, convenient access to the Beach, Private Swimming Pool, Hot Tub, & Game Room w/Pool Table, all here for your enjoyment & just a few of the reasons why your family will be thrilled when they vacation at "Arlene's Sea Glass" in Kitty Hawk. Boasting beautiful decor throughout w/ hardwood floors & Ocean Views from the top level & observation deck, this home has a great location that is within easy walking distance of the beach (approximately 235 yards to Beach Access at Balchen Street). The mid-level provides a covered deck overlooking the pool patio area & 3 bedrooms. The ground level has a game room w/pool table & TV that will keep all entertained after a day spent playing on the beach or lounging by the pool. Very well equipped with TV's in all bedrooms, wet bar w/Full Size Refrigerator in the Rec. Room and ample decking. Located in a quiet area & convenient to area shops, fine restaurants, & SeaScape Golf Links, this home will be a favorite for years to come. Ground Level: Parking for 4 Cars, Entry to Home, Game Room w/Pool Table, TV, Wet Bar, Laundry Area, Access to Patio Area w/Hot Tub, Private Swimming Pool, Charcoal Grill, & Enclosed Outside Shower. Mid Level: 3 Bedrooms (Master Suite w/King & Full Bath, 1 w/ Queen, & 1 w/Bunk Set & Single), Full Hall Bath, & Covered Deck Overlooking Pool Area. Top Level: Living/Dining/Kitchen Area, TV, Ocean Views, Half Bath, Master Suite w/King & Full Bath, Covered Deck, & Steps to Observation Deck w/Beautiful Ocean Views. 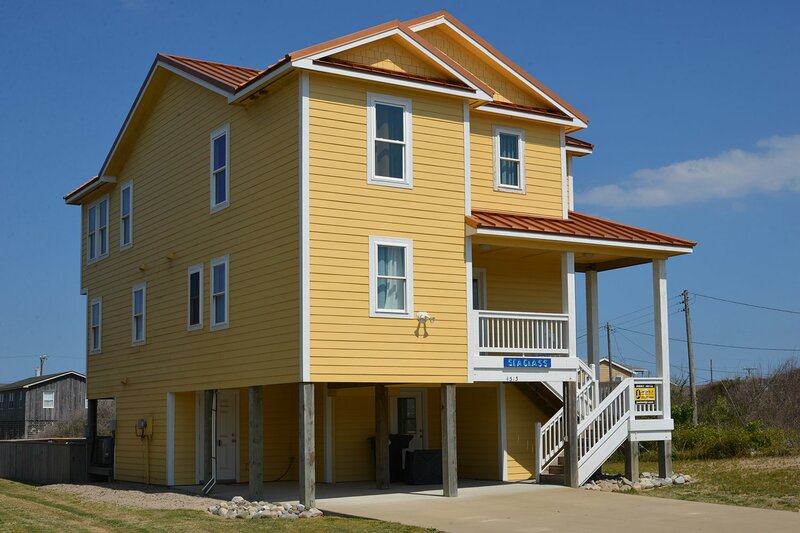 Features include: C/AC & Heat, Washer/Dryer, Dishwasher, Microwave, Phone, 6 TVs, DVDs, Wireless Internet, Deck & Pool Furniture, & Direct Beach Access. No Pets. This is a Non-Smoking Unit. Ping Pong coverter in game room is not avaliable for 2019. 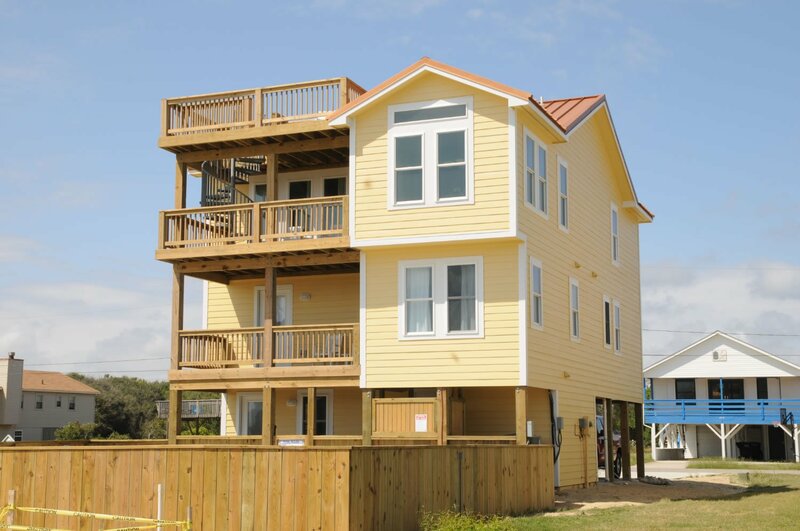 Convenient Beach Access, Private Pool and Game Room . Love it. Amazing views and short walk to the beach. We thought the home was lovely and very welcoming. We loved the house, the beds were very comfortable. Kitchen was fairly well stocked. The house was fantastic. A great location and very modern. The beds were all very comfortable and the layout was perfect for our family. Loved the location and furnishings. View was wonderful, nice pool. The location was awesome, we loved the house. We used the pool almost every day after being on the beach. Your surfboard and sign are awesome. Loved our stay! The home itself is lovely and very comfortable. The view from the decks were gorgeous. Family really enjoyed the house. Plenty of room for our 3 families (6 adults, 4 kids )and the pool was a huge hit with the kids. Walk to beach was convenient. We love staying here and look forward to next summer.